With three Camp Bow Wow franchise units open or under development in Charlotte and Matthews, North Carolina, and Fort Mill, South Carolina, James and Patti Daniel feel like they’ve already got a solid foot on the path toward strong retirement income. 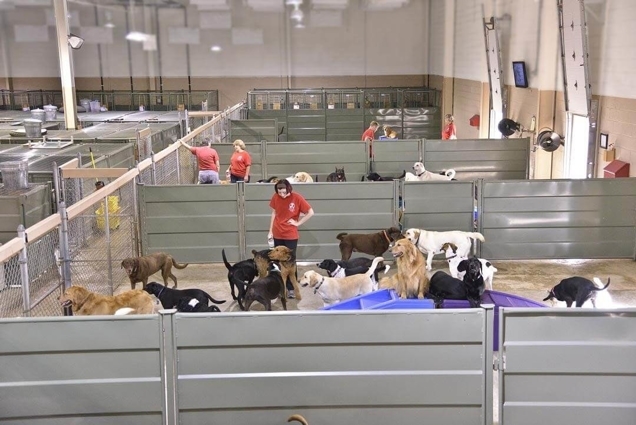 Dog lovers James, a lawyer in private practice for more than 30 years, and Patti, a fifth-grade social studies teacher, saw the Camp Bow Wow investment opportunity as a smart piece of their retirement planning. Their two black labs, Chelsea and Chester, were their very first customers. Here’s the story of how they got involved in Camp Bow Wow and why they’d recommend the brand to others like them. How long have you been a franchisee? We opened our first Camp in 2011. What were you doing before becoming a Camp Bow Wow franchisee? I’m a lawyer, in private practice for over 30 years. My wife, Patti, is a school teacher. We’re still actively involved in our careers but decided a few years ago to invest in Camp Bow Wow. We saw it as a potential retirement career. Right now we have employees who manage the Camps for us; we have a general manager who is responsible for all of our businesses, and then we have a Camp manager at each location. We have a marketing person who supports all the locations, and a manager for the Home Buddies (pet sitting) brand. I probably spend 40 hours a month with the finances and bookkeeping side of things, and my wife is involved in some of our social media and marketing, spreading awareness of the brand around town. How did you decide Camp Bow Wow would be a good business opportunity? I guess we started looking at this about five years ago. We’re dog owners, and the only boarding facility we had before was at the vet, and we didn’t like the environment the dogs were in when we were traveling. We thought there was a need in this market for a Camp Bow Wow. I had heard their brand name and saw some of their advertising and got curious. We did a little more research and went out to Colorado, and we felt like it would be a good fit for our business goals as well as a good fit with our interest with dogs. They’ve had a strong growth curve, even straight through the recession years. That indicates a lot of brand strength. The business model seemed like something I could manage without needing to be involved on a full-time basis. Certainly I wasn’t looking for a new job or career. Did you expect to scale up so quickly? That was really the plan going in. The three territories we are in are adjacent territories. We live in a high-income, high-growth part of Charlotte, and we’re close to the three locations and felt that would be a way we could take advantage of a quick way to scale up. We’re trying to open a new location every other year. Each Camp has a chance to get established and stabilized before we take on the next location. By taking advantage of our existing staff and cash flow, that makes it a little easier: In the first location, it was a learning process. It was easier for the second Camp in part because of our experience and in part because we had a nucleus of clients to migrate to the new location. What do you like about owning the business? The law firm where I’m a partner has 550 lawyers, so I have enough flexibility to be available for calls if I need to be. I can do the bookkeeping on weekends. Also, it’s very rewarding to be able to deliver a service that’s important to people because you’re taking care of a family member. The families trust us to take care of their dogs when they’re at work or traveling. And it’s rewarding to provide a livelihood for our employees, quite a few employees now. What makes it fun? It would be tough to find a better business to be in. There’s always a challenge with taking care of your customers and employees, but at the end of the day you’re taking care of dogs. It’s fun to go to see the dogs when they’re having fun, and it’s fun to watch the customers when they pick up the dogs. Knowing what you know now, if you were just starting out, would you still become a Camp Bow Wow franchisee? I think probably now more so than when we first started. I think there’s a lot of potential for future growth with the brand and the services we provide, especially with the support we get from corporate. I feel like there have been a lot of positive developments for franchisees and I expect to see a lot of growth in the brand in the future. How does HQ help you? What are some of the most valuable things they do to support you? Anyone looking at a franchise business, and particularly in my situation where you’re not really involved full-time, you want a proven business model that can be replicated successfully. What we get from corporate in terms of support is a lot of value added through things like technology enhancement and marketing support that an independent business wouldn’t have. Are you able to meet your business goals, or are you on your way to meeting your goals, by owning the business? I think we’re on our way. Like everything, it takes a while to get established and have stable cash flow. It’s certainly a positive curve. Of course, your commitment and your level of involvement are key. What piece of advice would you give prospective franchisees? When I talk with potential franchisees who call to investigate the brand for their own due diligence, one thing I always try to point out is that, even though we’re not there every day actually operating the Camp, I’m still the one that gets the call in the middle of the night when the alarm goes off or if any type of emergency arises. You’re still the one responsible. Once you open, you never close. You’ve always got dogs there, and that’s the thing I want to point out to people who are used to a 9-5 job. It’s still a 24-7 commitment.